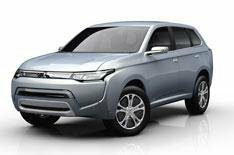 Mitsubishi reveals electric car plan | What Car? Mitsubishi predicts electric cars and plug-in hybrids could account for as much as 50% of its sales by 2020. The company is planning a dramatic increase in such models, the first of which will be a plug-in petrol-electric version of the ASX SUV that will go on sale here in January 2013. This will be followed by a plug-in hybrid version of the next-generation Outlander, which takes its inspiration from the PX-MiEV II concept car at this year's Tokyo motor show. A supermini-sized electric car and a small petrol-electric SUV will be unveiled in late 2013, with UK sales starting the following year. Longer-term plans include replacements for the Evo performance saloon and the Shogun SUV, which are both due to get plug-in hybrid power. According to Mitsubishi, these new models will help cut its average CO2 in half by 2020, when compared with 2005 levels. Mitsubishi has also admitted that it is keen to re-enter the family saloon market. It has not offered a car in this class since the Galant went off sale in 2003. However, according to Hiroaki Ohtsuka, Mitsubishis global design director, the company feels this sort of car would make it a much stronger brand. Ohtsuka also revealed that Mitsubishi plans to abandon the big, trapezoidal front grille found on most of its current models, because it feels the look is too aggressive. Future Mitsubishis will have a more sophisticated front-end treatment inspired by the triangular shape of the Mitsubishi badge.